I thought only had to peddle if battery ran flat? Simon I am in the situation where my right knee will not bend enough to let me pedal. I am fortunate in that if I take it carefully my C5 will start rolling without pedalling and without causing the belt to jump teeth. In case needed I have fitted a single bike pedal toe strap to the left pedal so I can pedal to a degree, it may help your son? I think another project coming chas ? Hi, you didn't mention which leg is handicapped. If it's his left leg then the left hand crank can be removed with no problem, if it's right leg then you could cut off the crank from the pedal wheel. The first option is easy, but the second means that the body must be removed first, and this is a tedious task, before you can get to the crank set. I don't think that just removing the pedal alone is a very good solution as the crank will still rotate with the possibility of catching in his clothing or knocking against his prosthesis leg. The C5 is a bit cramped in this region. If the problem is with his right leg and you do decide to go ahead I'm sure that Chas will be able to help you concerning any necessary mods. An electric scooter is a good solution, but not as much fun as a C5. I wish you both the best of luck, regardless of which decision you make. 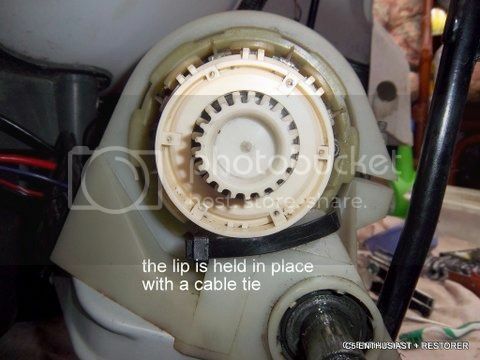 One small point, it would also pay to check and see if the motor is supported with a bracket or cable tie. For reference, click on 'RESOURCES' at the top of the page, go to 'Miscellaneous', and there you will find 'Motor Bracket'. Sorry no photo available of the cable ties, but maybe Chas can come up with one. The reason for this mod is that when the motor has to supply high torque, e.g. when starting, it has a tendency to twist. This twisting can result in the belt slipping, which in due course results in radical wear in the belt and the sprocket. Sorry this is a bit long winded, but maybe of some help to you. All the best. Or maybe chas could make sum of these then we don't need cable ties ? Hi 51, if it's not too much of a problem, I'd also like a couple of the brackets. Hi Dave, tried to insert the pic but couldn't get it to work. Hence the description.